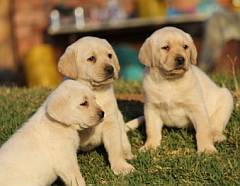 We have a great passion for Labrador Retrievers, and have started some years back to breed good natured puppies. Although there was no animal that was suited for Adam from the beginning of time (which of course proof that human friendship are still greater than animal friendship) YET of all the animals man can find, dogs are and will always be man’s best friend! The Labrador Retriever are one of the greatest family dogs man can have! That is why they are a vital part of our family and social life’s. They are loyal and of the best nature dogs you can get, especially with children, no wonder it is one of America’s number 1 dog breed seller! We have all three colours - black, yellow and chocolate puppies. We have puppies available on a regular basis. We raise our puppies with much love and care and spend much time in their nurturing. From a young age we interact with them so that they may be well socialized by the time they are received in their new homes. We keep intensive records of all our canines and of every puppy we breed. Deworming is one of the greatest things new puppies need (not forgetting food and much care and love). Almost all puppies are born with worms which they get from their mothers. As they grow older they explore and eat almost anything they can find! We start our deworming cycle at 2 weeks of age and they are de-wormed every 2 weeks from the age of 2 weeks until they leave at the age of 8 weeks by us. They should be dewormed by their new owners until the age of 12 weeks and thereafter every 3 months. We inoculate our puppies at the age of 4 weeks and again at the age of 6 weeks. Inoculation takes some time (about 2 weeks) to work into the immune system. Because the puppies get inoculated twice, at the time they get to their new homes their immune system is already stronger to fight of viruses and diseases they may attract. All our Labrador puppies are micro-chipped and registered on the micro-chip database. We also give a puppy starter pack with every puppy with guidelines that will help the new owner to take good care of their new family member. 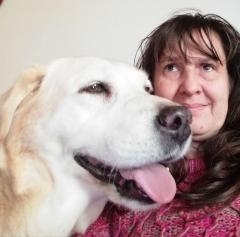 We also provide help to new owners for months after they have collected their puppies, thus making new friends and getting much feedback on the puppies as they become full grown! We expect of the new owners to make the welfare of the puppies they adopt an important matter and to take responsibility for the well being of their dogs and to give them the love, attention and exercise they need and deserve. We also encourage every Labrador Retriever puppy owner to train their canine from a young age and to where possible take them for formal training. A trained or disciplined dog is a much greater joy than a dog that is left to him/herself! They learn quickly and are intelligent breeds. Labradors can also adapt well in smaller areas but need regular walks and exercise. We live on a small holding outside Montana Pretoria and can fly or deliver a puppy to all the major airports in South Africa at the expense of the buyer. Our latest litter of puppies with their parents can be viewed at our website, or via e-mail by request. A deposit is needed to book your puppy. Jarocas is a registered affix with KUSA. 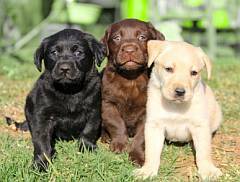 Our Labrador Retriever puppies are registered with KUSA. We do give a Sales information agreement card with every puppy with the details of the parents, etc, to the new owner. The vaccination and deworming record are also supplied with collection of the puppy. The original registration certificate for your puppy will be posted by registered mail approximately four to eight weeks after delivery of the puppy and we do inform every new owner of the mailing. Breeding restrictions may be put on some puppies.